Daniel Gyurta's time for this 200 m event was 2:07.28, a world record. Each frame is 0.1 seconds apart. Frame #1: The hands are spreading while the swimmer is in streamline. Frame #2: Streamline is maintained as the arms are repositioned for propulsion. The upper arms abduct and the elbows bend. The hands are pitched mostly backward and slightly outward. The head begins to move as the initiation of repositioning to breathe. Frame #3: The head begins to rise preparatory to breathing. The asperities of the face come into play and produce considerable surface resistance (the milky "beard"). Streamline is maintained. The arms are in the strongest position for propulsion. Abduction of the upper arms has increased, the elbows have remained "high", and the lower arms are positioned to provide considerable propulsion as well as force to support raising the head, which is occurring independent of the shoulders. The wide pull occurs because the upper arms rotate in the shoulder socket (the Glenoid fossa). Frame #4: Propulsion with the arms is complete. The final force production is with the total arm surfaces. The shoulders begin to rise. The body continues in full streamline. Frame #5: Since arm propulsion has ended, the hands turn and cut in and up. The elbows collapse very quickly. The hips and legs continue to trail in a streamlined position. The head has broken through the water surface as the shoulders continue to be elevated. Frame #6: The head and shoulders are at their highest point. It is assumed that inhalation is taking place or has been completed at this stage. The back is hyperextended along with some hyperextension at the hips. The elbows have been drawn to the swimmer's sides while the hands have moved forward and up. Residual turbulence created by the rising face and shoulders dissipates along the chest. Frame #7: This frame reveals the "hidden" problems with the elbows-in over-the-water-hands breaststroke recovery. Behind the upper arms as the hands move forward and upward over the water there are large pockets of turbulence indicating a large increase in resistance. The question has to be asked: "does the resistance reduction from having the hands out of the water offset the extra resistance created by the arms to get to that position?" In this writer's opinion, the answer would be a resounding "No!" As the shoulders and head return, there is a large amount of water displaced (the milky blanket over the body down to the upper thighs). That displacement derives energy from the swimmer and also gravity. As the hands/arms are thrust forward, the legs are drawn up quickly (incurring more resistance). Frame #8: The hands have re-entered the water at an angle. The water displaced and increased resistance causes significant turbulence. Of particular note is the very white area above the arms. That indicates resistance that is caused by the arms moving forward and down. If the arms had been recovering underwater at a close to constant depth, some resistance would have been created but certainly not of the same magnitude as that evidenced in this frame. The return of the head and shoulders shows how much turbulence is created. The level of turbulence in the return is much greater than that caused in the head/shoulder rise (Frame #6). The head/shoulder turbulence is augmented by turbulence still emanating from the upper arms. The thighs also increase the frontal resistance of the swimmer. This picture clearly shows why this part of the stroke reduces the forward velocity of the swimmer to its lowest value in the whole stroke. Frame #9: The mass of white water above the swimmer shows how much turbulence is created in this stroke. The propulsive phase of the kick has just begun. The entered arms go deeper than horizontal. The kick is propelling a streamlined body but the arms are angled down. That angle will also lead the shoulders down, be it only by a small amount. Frame #10: The kick is completed but the arms are still down and so the kick finishes down further than could be achieved if total streamlining actions were in place. Frame #11: The legs are brought together but still low. The arms have risen slightly. The overall position of the swimmer is a shallow convex curve. 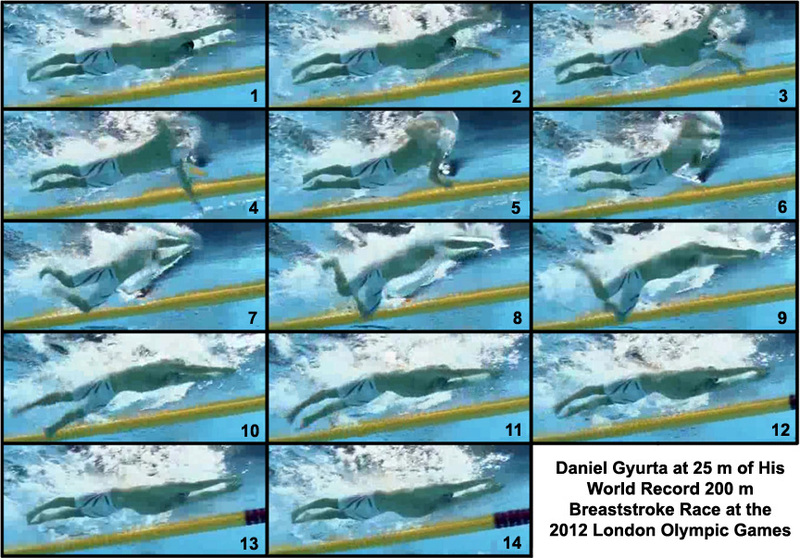 Frame #12: Daniel Gyurta does something not evidenced in any other breaststroke swimmer on this web site. The lower back muscle are contracted which causes the legs and the torso/arms to rise to a streamlined position. When followed by the following frames, the overall movement is suggestive of a wave. Unfortunately, there is no benefit to this action as no propulsive movements are made to counteract its resistance increasing outcome. Frame #13: The streamlined position is refined slightly more. There is a virtual straight line from the back of the hands, along the body, and along the legs. The intensity of the above-body turbulence begins to abate. Frame #14: The hands begin to open. This position is followed by the position illustrated in Frame #1: The opening hands occur only when the swimmer is in full streamline. Daniel Gyurta displays an arm pull that appears to be very effective. The positioning of the arms to apply a large arm area that develops propulsion (Frames #2 through #4) could be used as a teaching model for breaststroke swimmers. Although a world-record holder and Olympic champion, the swimmer illustrates undesirable elements in the arm movement forward. Initially starting in a good position forward of the shoulders (Frame #6), the arms dive forward and down, and then the action to correct the disadvantageous position achieved through that movement all create unnecessary movements and increased turbulence. It would seem that recovering below the water and extending forward at a constant hand-depth would be better form and create less resistance. The diving arms on recovery lead to the feet finishing low as part of a counter-balancing reaction. Then the body straightening and its realignment, and the hands and feet rising cause an overall readjustment to a streamlined position. That corrective action moves a lot of water and takes time that could be used to achieve a higher rate. That is an unnecessary action. Gyurta's arm-pull is worthy of emulating but the rest of the stroke has problems. Only the final streamlined posture (Frame #13) is a part of the non-arm-pull that is worth emulating.